(Campbell County) Recorder about it. I suggested a county-wide task force to see if we can get some dialogue going. And, in a follow up email, Mayor Rachford sent me a copy of the letter that he sent out to all school superintendents, boards of education members of Campbell County, Dayton, Bellevue, Ft. Thomas, Southgate, Silver Grove, and Newport Schools, and Mayors of Dayton, Bellevue, Ft. Thomas, Southgate, Silver Grove, and Newport, and Campbell County Fiscal Court. Mayor Rachford and I spoke about his letter. I offered my support and my help. Would you do the same? Call Mayor Rachford at his offices at the City of Alexandria and join the effort. We can just look at the stats from the Kentucky Department of Education website and find out if more money is the answer. Please focus your attention on the seven NKY districts which are below the midpoint in ranking within the state. These seven districts are the most troublesome. Two of these districts spend less than the state average per student. The other five spend more that the state average. Some of them spend considerably more! 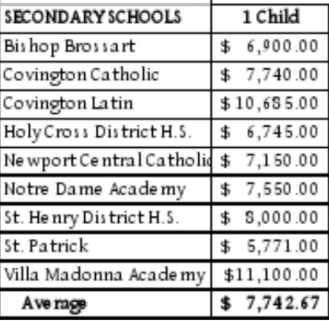 No, you are not reading a misprint: Silver Grove spends almost $10,000 per student more than the state average! All seven of these districts spend more than the state average as a percentage of total expenditures on their administrations! And again, you are not reading a misprint: Bellevue’s administration expenditures are 19.10% of their total spend! 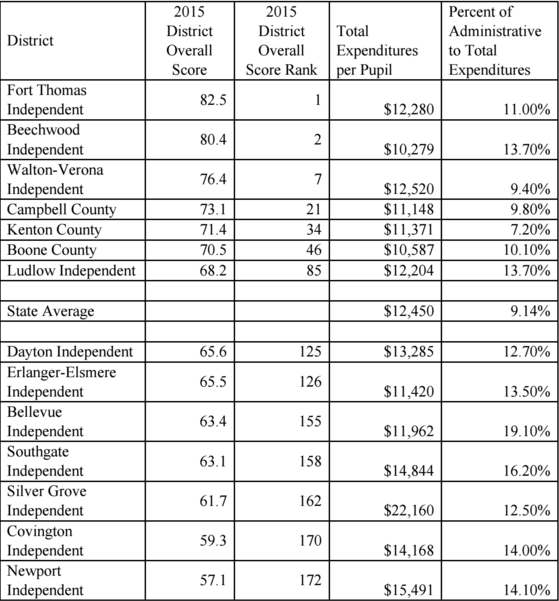 Five of those seven bottom tier districts spend more per student than the state average. Now, do you still think that we need to spend more money to improve the results? Some readers have suggested that we could allow parents to spend their public education money within the private system. Students with diplomas from private high schools are considerably more likely to be ready for college than those with diplomas from other schools, according to data from ACT, which produces a standardized test for college admission that carries the same name. Eighty-­five percent of 2015 graduates of religious and independent schools who took the ACT met or exceeded the test's college readiness benchmark score in English, compared to 61 percent of graduates from public schools. The share of students who met or surpassed the benchmark scores in other subjects was also higher in private schools (reading ­ 66 percent vs. 44 percent; math ­ 60 vs. 40; science ­ 55 vs. 36). Now, you be the judge. Do you think spending more money within our current system will improve school results?